I thank you, my God, for having in a thousand different ways led my eyes to discover the immense simplicity of things. Little by little, through the irresistible development of those yearnings you implanted in me, as a child, through the influence of gifted friends who entered my life at certain moments to bring light and strength to my mind, and through the awakenings of spirit I owe to the successive initiations, gentle and terrible, which you caused me to undergo: through all these I have been brought to the point where I can no longer see anything, nor any longer breathe, outside that milieu in which all is made one. The last day of September. Contented and reflective. Quieter by far than the last few glad days in Paris. Never far from the river, I’ve lost count of the times I watched a leaf or a twig baptised into its flow. Once connected to one branch and one tree. Now carried, moving onward in a larger universe. Then, a bud, a leaf or a twig, somewhere. Now, elsewhere. Matured and maturing still. Dying and living. Living and dying. Here. On the move. On the river. Higher, broader, deeper, wider. 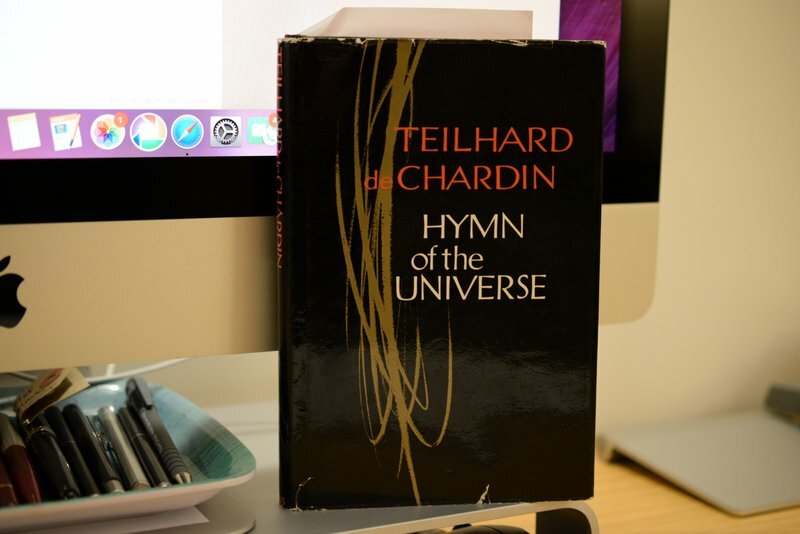 Yes: as Teilhard before me, I notice ‘the immense simplicity of things’. Leaf and twig will die into that ‘milieu in which all is made one.’ And I recall another quiet moment, another leaf, another river.